Alameda County Sheriff Gregory Ahern co-signed a letter sent to Sen. Jeff Sessions last December, supporting his nomination to lead the U.S. Department of Justice. Now the letter is drawing criticism from local immigration and civil-rights groups. 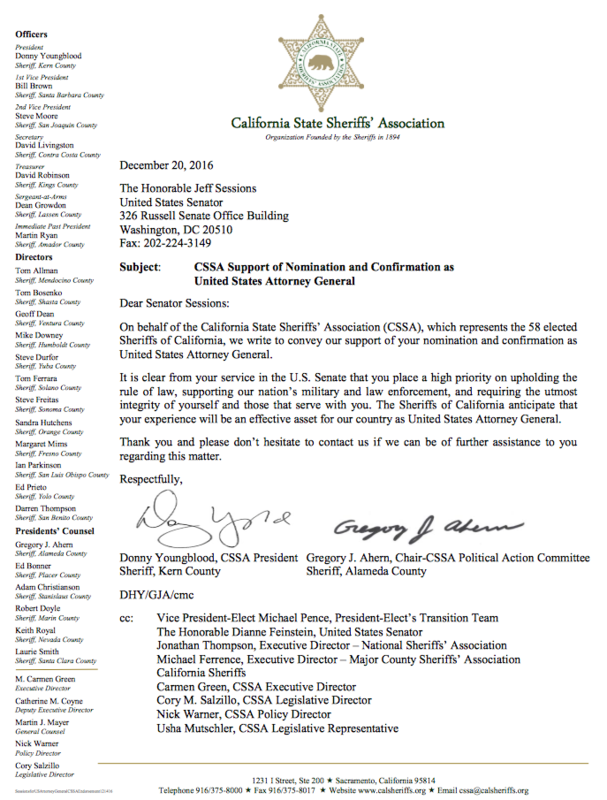 Letter from the California State Sheriffs Association supporting Jeff Sessions nomination to be Attorney General. "[W]e write to convey our support of your nomination and confirmation as United States Attorney General," the letter from Ahern and Kern County Sheriff Donny Youngblood states. "It is clear from your service in the U.S. Senate that you place a high priority on upholding the rule of law, supporting our nation’s military and law enforcement, and requiring the utmost integrity of yourself and those that serve with you." Ahern and Youngblood sent the letter on behalf of the California State Sheriff's Association. Ahern is chairman of the association's political action committee. 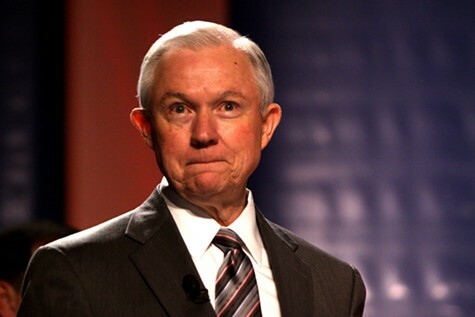 California's congressional delegation strongly opposed Sessions' nomination, due what they characterized as his past efforts to undermine civil- and voting-rights laws, and his staunch advocacy of anti-immigration policies. "In the 1980s he was rejected from serving as a federal judge due to his blatantly racist comments," Congresswoman Barbara Lee told her colleagues during Sessions confirmation hearings in January. She called him an "extreme and divisive figure." In the past, Sessions has called groups like the NAACP and ACLU "un-American," and "Communist-inspired." Ahern said in an interview that he didn't personally sign the letter of support. Rather, his signature was electronically applied as a matter of routine business for the association. He said the sheriff's association sends out as many as 100 letters each year in support of state and federal law-enforcement appointees, and that the notes are meant to build a relationship. "We have to work with these people in the future," said Ahern, who confirmed that he voted along with other sheriffs to send the letter of support. "This builds a better relationship if we have a letter of support on file." Alameda County Supervisor Keith Carson said he's "totally opposed" to Jeff Sessions. He called the California State Sheriff's Association a "super conservative body," and said Ahern and the other sheriffs have adopted many positions that are at odds with the supervisors. Immigrants' rights groups issued a strongly-worded statement this morning about the sheriff's letter. In an email, the Alameda County United in Defense of Immigrants Rights coalition wrote that, "the Sheriff's entanglement and collusion with Trump and Sessions' xenophobic agenda is a disgrace." ACUDIR has asked Ahern to further restrict his office's contacts with Immigration and Customs Enforcement agents, who often seek to arrest undocumented immigrants from the sheriff's jails. The coalition has also criticized the sheriff's association for opposing Senate Bill 54, a proposed state law that would further limit local and state law enforcement interactions with federal immigration agents. Sessions has a long history of opposing even legal immigration. He helped defeat the 2007 reform bill that many Democrats and Republicans supported, which would have provided a path to legal citizenship for millions of undocumented people already living in the United States. Many fear that, as attorney general, Sessions will ramp up deportations and sign off on more aggressive enforcement tactics, such as bringing back workplace raids. Sessions is also a supporter of continuing the types of hard-line drug war policies that most California lawmakers now reject. He said during a senate committee hearing last year that "good people don't smoke marijuana." Medical and recreational pot are big businesses now in Alameda County, and state and local officials have de-emphasized enforcing anti-marijuana laws which have disproportionally impacted Blacks and Latinos. Ahern said that if and when the state sheriffs association disagrees with the new Attorney General, the group won't hesitate to push back. "If we opposed any type of actions or anything like that, we do author those types of letters too, and say we object to what’s going on," said Ahern.